Background: Labor is a stressful situation that may have an adverse impact. Aromatherapy is a method to control anxiety and stress of women. This study was conducted to investigate the effect of aromatherapy using essential oil of orange on women's anxiety during labor. Materials and Methods: In this clinical trial study, 100 women during labor were randomly assigned to two groups: intervention group and control group. The women in the intervention group were exposed to orange essential oil, but the women in the control group were exposed to distilled water. The women's anxiety was assessed using the Spielberger inventory. Moreover, physiological parameters such as systolic and diastolic blood pressure, respiration and pulse rates were assessed in all the women before and 20 min after the intervention. The data were analyzed by Chi-square, Wilcoxon, paired t-test, and Mann–Whitney U test. Data were evaluated with the SPSS 16 program. The significance level of P < 0.05 was considered. Labor is considered a stressful condition in pregnant women which may have negative consequences such as uteroplacental insufficiency and angina. It may interfere with uterine muscle contractions and progression of labor. It has been shown that stress and anxiety increase the entry of calcium and sodium into the cell that accelerates heart rate and changes the physiological parameters. In a pregnant woman, the above-mentioned conditions lead to uteroplacental insufficiency and fetal hypoxia. Some studies have shown the impact of aromatherapy to relieve anxiety during labor,,, but Hur et al. have reported that essential oils might not reduce anxiety. Due to lack of studies on the effect of aromatherapy on anxiety of women during labor, this study aimed to investigate the effect of aromatherapy using essential oil of orange on women's anxiety during labor. Because of limited studies about various aromas in labor in this population, researchers preferred to use one type of essential oil and not a mixture. This is a clinical randomized trial. This study's research proposal was approved by the research council affiliated to North Khorasan Medical Science University, Bojnourd, Iran. Also, the ethics committee of North Khorasan University of Medical Sciences approved the study's ethical considerations. This study has been registered in the IRCT with the code of 2012111811515N1. One hundred pregnant women who referred to a teaching hospital in 2012 and 2013 were chosen. The investigator referred to the childbirth unit of the chosen hospital and invited the probable participants to enter the trial. Participants were randomly assigned to two groups: Intervention and control. The sample size was determined based on a pilot study with 95% confidence interval and a power of 80%, a society variance of 6, and a mean difference of 3. Thus, 50 participants were selected in each group. However, two participants left the intervention group due to receiving analgesic drugs and losing eagerness to continue participation in the study [Figure 1]. The inclusion criteria were: Nulliparous women of age 18–35 years with a singleton pregnancy, gestational age between 37 and 42 weeks, and cervical dilatation 3–5 cm. The exclusion criteria were: Having the history of hypertension (BP ≥ 14/9), suffering from headache or migraine; losing the acuity of smelling sense due to cold or any allergic disorder; using analgesic or anti-anxiety medication during the intervention or 3 h before intervention; having any psychological disorder, epilepsy, or asthma; experiencing disturbance in labor process, induction of labor, and fetal distress. The women signed the informed consents. Blinding in the present study was not possible. Randomization was accomplished by using sealed opaque envelopes that contained the allocation of participants to one of the groups. Thus, the allocation was determined after opening the envelopes. In order to disperse odor and its effect on the control group and for reduplication of samples with the last post, sampling was conducted in one working post in a day. To prevent the researcher's bias, data were collected by a researcher assistant. For all women, demographic data were collected and the physiological parameters (systolic and diastolic blood pressure, pulse, and respiration rate) were measured before the intervention. The Spielberger inventory was completed with the researcher's assistance. The women in the intervention group were exposed to two drops of essential oil of orange peel 2% (produced in North Khorasan Pharmacological Research Center of Medicinal Plants). The women in the control group were exposed to two drops of placebo (distilled water). Essential oil and placebo were placed on non-absorbable and clean napkins that were attached to the participants' clothes at a distance of 20 cm from their chins. This method of intervention is consistent with other studies., After 20 min of the intervention, physiological parameters were again measured and recorded, because insensitivity of the olfactory receptors occurs after 20 min of inhalation. The Spielberger inventory was also completed. The physiological parameters were measured and the inventory was completed between uterine contractions. After the completion of the intervention period, the napkins were removed except in cases where the mother desired that it should remain. The Spielberger inventory has 20 questions and each question contents four options. The total score of anxiety ranges from 20 to 80. The higher score means the higher state of anxiety., The blood pressure was measured by a calibrated sphygmomanometer in completely fixed situations. Respiration and pulse (radial artery) rates were counted in a complete-one-minute. To determine the normality of the variables, Kolmogorov–Smirnov test was used. Parametric tests were applied in normal variables; non-parametric statistical tests were used in non-normal variables. Non-normal variables were described as middle, interquartile range (IQR) and normal variables values were shown as mean and standard deviation. The data were analyzed using Chi-square, Wilcoxon, paired t-test, and Mann–Whitney U test via the SPSS 16 program for Windows. The statistical significance was set atP < 0.05. A total of 96 participants completed this study. 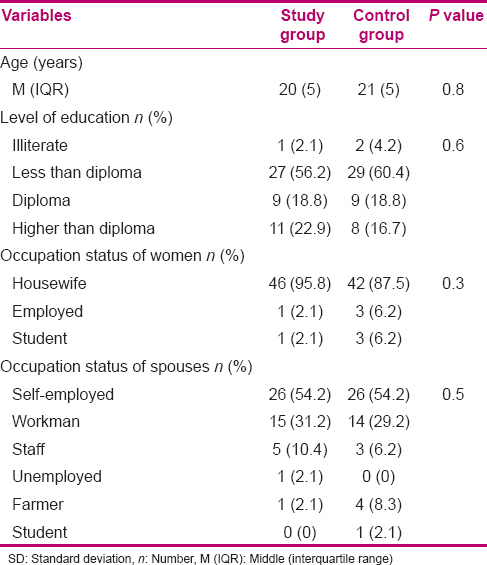 Mann–Whitney U test for age and Chi-square test for level of education and occupation status of the participants and their husbands showed that the experimental and control groups were homogeneous. The results of the verification of homogeneity of these two groups are presented in [Table 1]. The level of anxiety of women in both intervention (P = 0.03) and control (P = 0.003) groups reduced after the intervention. 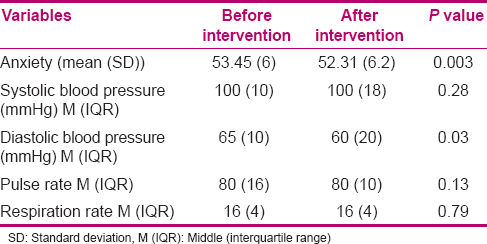 However, the reduction was more in the intervention group (score = −3.08) in comparison to the control group (score = −1.14). No significant change was found in the physiological parameters such as systolic and diastolic blood pressure and respiration and pulse rates of women in the intervention group after the intervention. However, diastolic blood pressure and heart rate of women in the intervention group were lower. The physiological indicators of women in the control group except diastolic blood pressure were not significantly different [Table 2] and [Table 3]. This study showed that aromatherapy by essential oil of orange reduced the level of anxiety and diastolic blood pressure and pulse rate. Mirzaei  and Tafazoli  showed that essential oil inhalation is effective in decreasing anxiety during labor. Our results were similar to those of the above-mentioned studies, although we used a different aroma. The reason can be attributed to cultural similarity, identical tool of measuring anxiety, and the same delivery phases. Lehrner et al. in a comparative survey found that orange aroma effectively reduced the anxiety of the patients who referred to the dentist office. Holm et al. reported that orange aroma was not effective in anxiety reduction on accompanies children in urgency part. These results can be attributed to hospital air-conditioners, materials, and other intervening factors that were responsible for such a result, according to their claims. Kim et al. found the effect of a mixture of orange essential oil with other essential oil on the anxiety level of nursing students who were practicing their first intravenous injections. They found that increase in pulse rate and systolic blood pressure was lower in the intervention group than in the control group. Perhaps the reason for this difference is that in their study, the participants were exposed to the aroma for a longer time than the participants of the present study and orange essential oil was used in combination with other essential oils. But in our study, participants had more ability for quitting of intervention, because we just used one aroma and an exclusive procedure for every subject. The limitation of this study was that blinding of the study was not possible. It is recommended to conduct further studies controlling the confounding factors when orange aroma can be examined for a longer time to determine its effects more clearly on the physiological parameters. Based on the results of the present study, it is concluded that orange scent may be useful in childbirth units to help women experiencing this stressful stage of their life (labor) in decreasing their anxiety and tension. We thank the Research Assistant of Medical Sciences University of North Khorasan for providing all the support for the study. We are also grateful to all the staffs, midwives, and nurses of Bent Al-Hoda hospital at Bojnourd, Iran. Research number 349 of your project. Mirzaei F, Keshtgar S, Kaviani M, Rajaeifard A. The effect of Lavender essence smelling during labor on cortisol and serotonin plasma levels and anxiety reduction in nulliparous Women. JKMU 2009;16:245-54. Abbasi Z, Abedian Z, Fadayi A, Esmaeil H. Effect of massage on physiologic responses on primiparous women. Horizon Med Sci 2007;13:28-33. Tafazoli M, Zaremobini F, Mokhaber N, Emami A. The effects of Lavender essential oil inhalation on level of anxiety during first stage of labor in primigravida women. JFMH 2011;12:721-6. Kim M, Kwon YJ. Effects of aroma inhalation on blood pressure, pulse, visual analog scale, and McNair scale in nursing students practicing intravenous injection at the first time. IJAST 2010;23:21-31. Davis C, Cooke M, Holzhauser K, Jones M, Finucane J. The effect of aromatherapy massage with music on the stress and anxiety levels of emergency nurses. AENJ 2005;8:43-50. Kanani M, Mazloum SR, Emami A, Mokhber N. The effect of aromatherapy with orange essential oils on anxiety in patients undergoing hemodialysis. J Sabzevar Univ Med Sci 2012;19:249-57. Kutlu AK, Yılmaz E, Çeçen D. Effects of aroma inhalation on examination anxiety. JTLN 2008;3:125-30. Burns E, Blamey C, Ersser S, Liayd A, Barnetson L. The use of aromatherapy in intrapartum midwifery practice an observational study. Complement Ther Nurs Midwifery 2000;6:33-4. Hur MH, Cheong N, Yun H, Lee M, Song Y. Effects of delivery nursing care using essential oils on delivery stress response, anxiety during labor, and postpartum status anxiety. Taehan Kanho Hakhoe Chi 2005;35:1277-84. Lehrner J, Eckersberger C, Walla P, Pötsch G, Deecke L. Ambient odor of orange in a dental office reduces anxiety and improves mood in female patients. Physiol Behav 2000;71:83-6. Kanani M, Mazloum R, Emami A, Mokhber N. Lavender essential oils fragrance therapeutic effect on anxiety of patients undergoing hemodialysis. J Mashhad School Nurs Midwifery 2010;10:63-71. Spielberger CD, Gorsuch RL. Manual for the State-Trait Anxiety Inventory STAI (Form Y) ("Self-Evaluation Questionnaire"). Palo Alto, California: Consulting Psychologists Press; 1983. 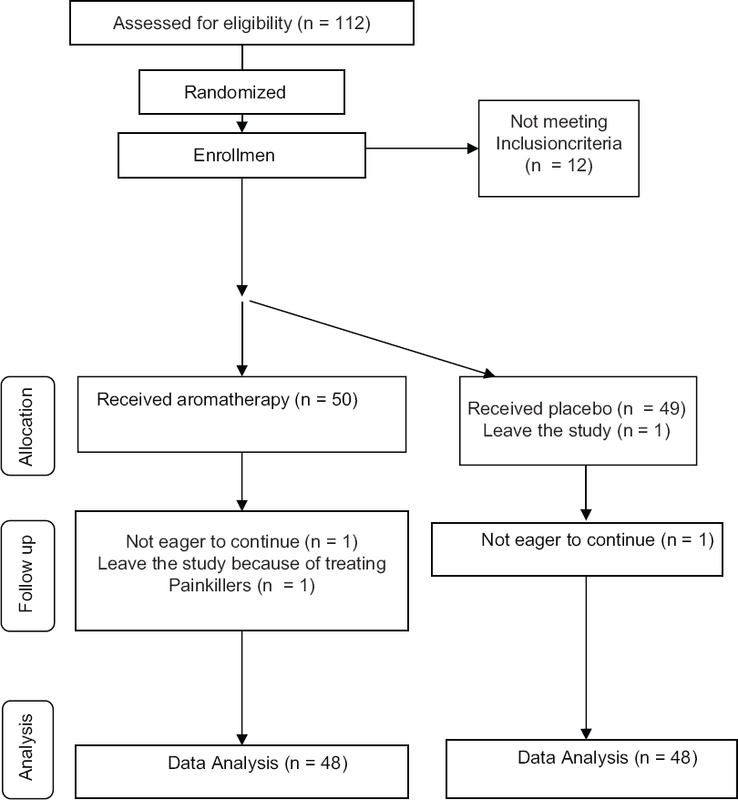 Holm L, Fitzmaurice L. Emergency department waiting room stress: Can music or aromatherapy improve anxiety scores? Pediatr Emerg Care 2008;24:836-8.